As the buzzer sounded, Zombie Nation’s Kernkraft 400 blasted from the PA system. 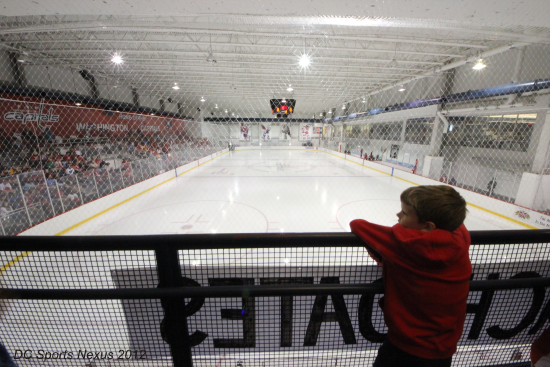 The crowd was heir feet applauding, and for at least a few seconds the practice ice rink at Kettler Iceplex was transformed into a mini-Verizon Center. While the few chants of “Let’s Go Caps” were mere pin-drops compared to the Verizon Center calls by the Goat, the young players on the ice got to experience some of the passion that fans in the area have for the Capitals. 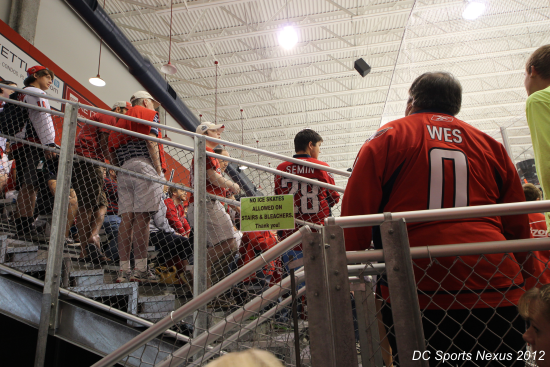 The team made sure to have the final scrimmage of 2012 Development Camp resemble a real game, not just for the fans, but for the players who hope to one day put on a real Capitals sweater and skate out on the ice at Verizon. Penalties were called, players spent time in the penalty box, and an announcer recapped each goal and assist as if it were a real game. The bleachers were standing room only. The fans packed in 5 deep around the boards while others crowded the railing on the second floor overlook. People were standing in the aisles and lined up against the back walkway of the seating area. The place was jam-packed. The spectators who weren't discouraged by the lack of seating options were treated to an action-packed scrimmage that had fans wishing it were October. Great saves, fancy goals, pin-point passing, big hits, an overtime game-winner, and even a bloody fight thrown in for good measure. Hockey! The scrimmage started out with Wes Johnson doing his thing to rally the crowd and the Capitals' new coach Adam Oats said a few words after a standing ovation to get the scrimmage started. In the first period the Red team got goals from Stanislav Galiev and Riley Barber and Daniel O'Donoghue scored for White. In the 2nd, Chandler Stephenson and David Vallorani scored for the White team. Vallorani has been the biggest surprise in camp and he finished the week with 4 goals, 2 assists, and a likely contract offer. The second period was physical with more solid checks, uncalled illegal shots, and the crowd favorite, a fight between Max Iafrate and Brent Tate (office linebacker). 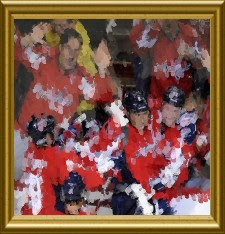 The fight was the bloodied Iafrate's 2nd of camp, despite specific instructions from Adam Oates to keep it between the whistles. After a non-eventful 3rd period, with only a few minutes remaining, the Red goalie was pulled, and the crowd began to get anxious. With 53 seconds left, Riley Barber fed a beautiful cross-crease pass to T.J. Syner who stuck it in for the tie. (the 2nd Barber-Syner connection of the week) The crowd was excited and Adam Oates held up his five fingers towards the officials to designate that there would be an overtime. OT was short and sweet, with Gregory Miller from the Red team scoring the final goal to give his team the 4-3 win. The crowd was pumped, the players were all smiling, and a very successful week of Development Camp came to an end. The players from camp will be headed all over the place next season. Some will go back to college, and hope for another shot next year. 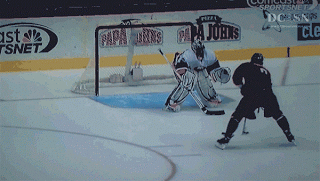 Some will toil in the lower leagues hoping to one day make it to an AHL try-out. Some will go back to their own countries to improve and become NHL-ready. Others will play in Hershey waiting for the call-up to come. And maybe, at some point in the future, some of these players will live out their dream and step on the ice wearing a Washington Capitals sweater.